According to the U.S. Bureau of Labor Statistics, women have consistently spent more on apparel than men since 1985, when the Bureau records began. Yet the fashion industry, which is often viewed from the outside as “women’s domain,” is actually dominated by men at the highest ranks, despite the fact that more women seek out entry-level fashion positions. In short, despite its reputation as an “effeminate” field, fashion hasn’t historically served as a shining beacon of equality for women—standouts like Chanel notwithstanding. Sadly, the same has been true regarding racial minorities. I recently undertook a graphic design project hoping to highlight the top 30 most influential women in fashion, and was frustrated to end up with a list of mostly white people of Western European descent. Whether because women of color have experienced greater barriers to success as a result of structural racism in fashion or because the media simply focuses on them less, I found their absence from fashion histories troubling. 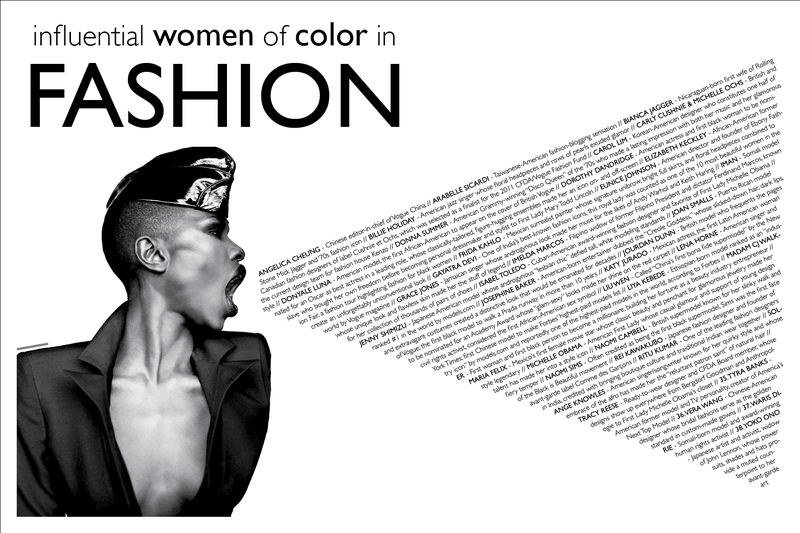 Feeling the weight of my own ignorance, I began asking friends to help me identify some of their favorite fashion-impacting women of color both today and throughout the last century, and the flood of responses prompted me to design this Alexey Brodovitch-inspired poster. It includes women who influenced the industry in all sorts of capacities, from models and bloggers to designers and first ladies. Photo: Ajuma Nasenyana as Grace Jones for W Magazine Spring 2007, photographed by Nathaniel Goldberg. (Right-click and view the image in another tab to better read the text). Admittedly, this list is imperfect to say the least, and highly arbitrary at best. I had no real way to measure relative influence, so I included some less historically significant women just because I’m particularly drawn to them, while excluding others I was less interested in. Nonetheless, it represents my personal attempt to start recognizing those whose impact has been significant, if under-celebrated. So, enjoy. Thanks to everyone who suggested the women included on this list. And if I left one of your favorite women of color in the fashion world out, leave her name in a comment below! 2 Responses to "Influential Women of Color in Fashion"
Don’t apologize, Maggie! Glad to have you anytime. And thanks so much for asking about prints! Would you mind emailing me at contact@unwrinkling.com with the size you might be interested in?